Hi, my name is Kendall Hulet, and I’m a product manager at Ancestry.com. I’ve probably met a lot of you at FGS, NGS, and other conferences. If not, I look forward to meeting you in the future. Read our original blog entry about it here. Ancestry.com - Love 'em or hate 'em? After what Ancestry.com tried to pull this week, you probably don't "love 'em." But then, just yesterday, I located a document for an ancestor on their site after which I thought to myself, "I sure am glad I have an Ancestry subscription - I probably wouldn't have found that anywhere else." Ancestry does provide a wonderful service. Although a bit pricey for many, I'm sure they put millions and millions of dollars into their efforts. We should not expect something for nothing. This week, however, Ancestry went too far. The genealogy community, represented by a variety of bloggers, fought back. Ancestry "listened" and removed (for now) their new Internet Biographical Collection database. Basically, Ancestry cached the pages from other's websites and called the pages their own by requiring a subscription to access them. Imagine Becky Wiseman's surprise when she received an email from someone asking for more information they found on Becky's website at Ancestry.com. Becky does not have a website at Ancestry.com, and she knew that what they were talking about was not her free pages at Rootsweb. Becky researched the issue and learned that Ancestry had copied her personal website and made it available, for a fee, at Ancestry. This didn't happen to just a few websites. Ancestry started listening, and soon made their new Internet Biographical Collection database free, after giving them a valid email address. Yesterday Ancestry issued a statement suggesting that they were trying to help the genealogy community by archiving websites. They have now pulled the database. I'm now more motivated to increase my efforts with the FamilySearchIndexing project. One of the columns I've set up in the Index view shows the relationship to me (if any), of each person in my database. It's a very quick way to see if I'm related to a particular person or family and I use it constantly. In fact, I've come to rely on it so much, I think I'd be lost without it. In the Index View, click once on any of the column headings. 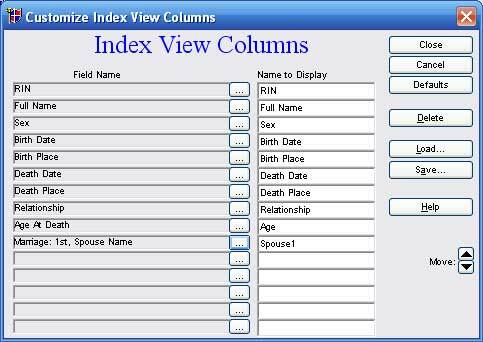 This opens the Index View Columns screen. There are 15 openings for information. To add a new column, click on the button with 3 dots. Here, there are 104 different fields from which to choose. Click on the desired field, then click Select. The new field now appears in the list. The fields can be arranged using the arrows in the lower right. Click Close. The new field(s) now appear in the Index View. If, after adding the new field, it is not visible, click on the right arrow at the bottom to scroll to the right. After scrolling to the right, you might not be able to see all the information on the left, such as the name. The solution to this problem is one of Legacy's greatest secrets. Watch the video for the "rest of the story." 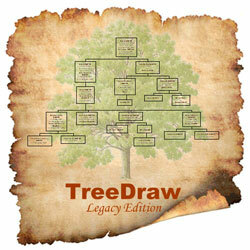 TreeDraw Legacy Edition from Spansoft offers enhanced charting solutions for Legacy Family Tree. Whether you need a large chart for a family reunion, or just want to display a small chart with all your family pictures, TreeDraw Legacy Edition gives you the tools you need to print stunning color charts. Create large wall charts... great for display at family gatherings! Add extra text, notes, titles, etc. Add pictures, images, clip-art, etc. Add simple graphics, lines, boxes, etc. Easy to use. Get your charts the way you want them... in minutes! View a larger image of these sample charts by clicking on the image below. TreeDraw is available from our online store for just $39.95. If you are a Legacy Deluxe edition customer, you can take an additional 15% off by using the coupon code found in the LegacyNews section of the Legacy Home tab within Legacy Deluxe. (The coupon is only visible if you have the latest update of Legacy Deluxe.) Coupon expires August 31, 2007. In this week's Family History Hour with DearMYRTLE, Legacy Family Tree's Geoff Rasmussen discusses what's coming down the pike for Legacy version 7, including compatibility with the much-anticipated new FamilySearch, also yet to be fully released. Myrt announces that she will be attending the 2008 Legacy Genealogy Cruise to Europe. Myrt also interviewed Pierre Cloutier of ProgenySoftware.com and discussed a Legacy add-on, Genelines. Genelines is software to place your ancestor's life in a timeline format, in relation to other family members and to points of local and national history. Finally, Myrt interviewed genealogy bloggers "Jasia" of CreativeGene and Schelly Talalay Dardashti of Tracing The Tribe to compare & contrast the use of the terms "genealogist" and "family historian". Genealogists have learned that "genealogy without documentation is mythology." We are taught to document our findings by entering a source citation for each piece of information we enter into our genealogy management software. Sound familiar? Have you ever received a copy of an obituary, only it lacks the name and date of the newspaper? It is simple to attach a citation to a printed document. Today's practice is to write the citation into the margin of the photocopy's face, or attach a printed label to it. However, as more and more documents are digitally distributed, this becomes more of a problem. Some researchers attempt to adequately identify a digital image by giving it a descriptive digital file name. Evidence Explained comments that "aside from the insufficient identification of the source, another problem ensues. As the file is distributed electronically, others in the chain are likely to change the file label to suit their own filing system, thereby eliminating all clues to the source." Adding the citation to a digital image is certainly possible using your photo editing software. 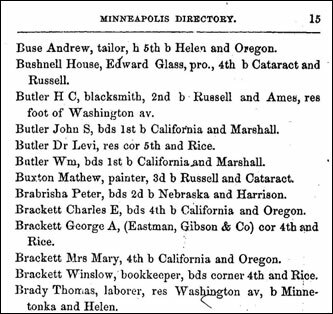 On the right is a scanned image of an 1865 Minneapolis, Minnesota city directory. Without the full citation, it is impossible to determine the correct year. Click on the Image menu > Resize > Canvas size. Change the anchor and width (see image on below). Change the Canvas Extension color to white. Click OK.
2. Using the text tool, type the citation, rotate it, and place it appropriately in the margin. It takes a couple of extra minutes to add the citation to a digital image, but the citation will always accompany the image when it is distributed with others. To learn more about Evidence Explained, or to purchase your own copy, click here. SALT LAKE CITY, UTAH—Thousands of published family histories, city and county histories, historic city directories, and related records are coming to the Internet. The Allen County Public Library (ACPL) in Fort Wayne, Indiana, Brigham Young University Harold B. Lee Library, and FamilySearch's Family History Library in Salt Lake City announced the joint project today. When complete, it will be the most comprehensive collection of city and county histories on the Web—and access will be free at www.familyhistoryarchive.byu.edu. The digital history project will target over 100,000 published family histories and thousands of local histories that are rich in names as well as biographical and genealogical data associated with those names. "Publishing those collections from the three libraries involved will make a significant and attractive family history digital library online for genealogists and historians," said David Rencher, director of Records and Information for FamilySearch. "I believe the most immediate, substantial contribution of this collaboration will be the addition of local history materials," said Allen County Public Library's Genealogy Center Manager, Curt Witcher. 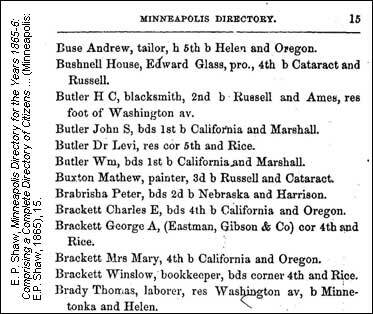 The collaborative project will digitally scan thousands of historic city directories, as well as city and county histories from North America. The ACPL and the Family History Library have the largest collections of city and county histories from North America. "I believe the strength of our two well known, well used, and well loved institutions working together is a terrific benefit to the genealogical community," added Witcher. Once digitized, the collections will have "every word" search capability, which allows users to search by name, location, date, or other field across the collection. The search results are then linked to high quality digital images of the original publication. Digitization efforts have begun. New additions will be noted and hyperlinked in the Family History Library Catalog at FamilySearch.org as they are digitized. 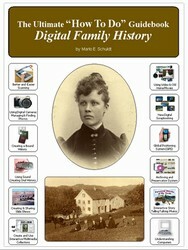 The collection can be accessed currently at www.familyhistoryarchive.byu.edu. FamilySearch is providing the computers, scanners, and camera operators required to complete the project. FamilySearch is a nonprofit organization sponsored by The Church of Jesus Christ of Latter-day Saints. FamilySearch maintains the world's largest repository of genealogical resources accessed through FamilySearch.org, the Family History Library in Salt Lake City, and over 4,500 family history centers in 70 countries. Take All Your Photos and Collections With You - But Leave Your Computer Home! Our Legacy add-on, Heritage Collector, helps organize and publish your digital images. Its latest update (a free download for existing Heritage Collector users) has an exciting new feature. The next time you travel to a reunion or visit relatives you can leave your computer home and still take all your photo collections and family history information with you on an external hard drive. You can plug the external drive into the USB port of another computer and run the new version of Heritage Collector just as if you were running the program on your home computer or laptop and have access to ALL your collections and information. Heritage Collector version 4.4 comes with a new feature that will automatically install a copy of Heritage Collector and copy all your photo collections on to an external hard drive of your choice. Just imagine how easy and convenient it would be to go to a relative's home, plug in your external hard drive into their computer import photos and information directly into collections on your external hard drive. No CDs or DVDs to burn, just quickly copy right to your hard drive. Best of all you will be able to get important information about the photos from your relative so you can caption each photo while copying it to your drive. When you return home you will be able to automatically copy and update your computer with all the new information you gathered. You can even use the external hard drive as a backup for extra security and peace of mind. The new external hard drives are high capacity, USB-powered (no AC plug in required) and small enough to put into your shirt pocket. So the next time you travel or fly you will be able to leave your computer home and slip the hard drive into your pocket and not worry about theft or damage to your computer as you travel. Take your external hard drive to the next reunion or family gathering so you can show them slide shows, photos and share your photos and information with them. If you make presentations, just plug in the hard drive and use the computer that is already set up for added ease and convenience. 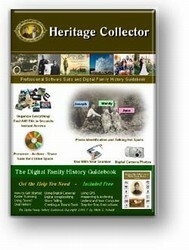 For more information on Heritage Collector, please click here. All the rules and "mine fields" for digital imaging. Learn about easier scanning, using sound, digital cameras, video and GPS, making digital scrapbooks, creating hard-bound books, preservation & archiving, and more more. Yours free with your Heritage Collector purchase. A $19.95 value. Click here for more information. Genealogists are always looking for new sources. Tracking down information about our ancestors is what we do best. Obituaries are a terrific source of information but genealogists sometimes overlook the hundreds of thousands of obituaries that are not published in newspapers. For example the Department of the Navy annually report to the U.S. Congress includes a lengthy list of obituaries of naval personnel who passed away in the previous year. These detailed obituaries give the genealogical details of the person's birth date, birth place and death date & place as well as the details of their military career. These reports by the Department of the Navy along with the thousands of other documents prepared for government use are consolidated in what is called the U.S. Congressional Serial Set. 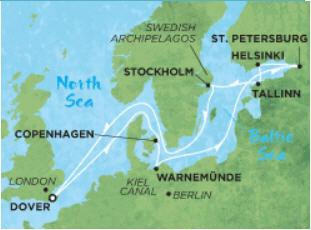 Join us on a fun and educational 12 day European genealogy cruise of the Baltic Capitals on the luxurious Norwegian Cruise Lines Jewel Ship. You will meet and learn from genealogy experts. You can enjoy the cruise even if you aren't a Legacy Family Tree user. The 5th Annual Legacy Genealogy Cruise will leave London, England and will sail to Copenhagen, Denmark; Berlin, Germany; St. Petersburg, Russia; Helsinki, Finland; Tallinn, Estonia; Stockholm, Sweden; and back to London. Discover the lands of kings and tsars all the way up to the Vikings. An area rich in folklore and fairy tales, you'll be transported back to the time of the original oceangoing explorers. Naturally, there are ancient cities, castles, museums and cobblestone streets at every turn. But, to the trained eye, that patisserie on the corner is to die for. And the boutiques down the street are waiting to be discovered. Enjoy exclusive Freestyle Cruising; it's about dining your way. Norwegian has as many as 13 restaurants on board. So take your pick, you could dine in a different restaurant every night of your cruise. Just let your palate be your guide. On the days we are at sea attend the Legacy Family Tree genealogy classes and learn the real secrets to becoming an expert with Legacy and improving the way you do your research. Go home with the knowledge and tools you need to be more successful than you ever thought possible. You will be learning directly from the experts. Norwegian Jewel sparkles with her exclusive Garden and Courtyard Villas - the biggest, most luxurious suites ever to hit the high seas. And that's just the beginning. Norwegian Jewel is like a giant, floating luxury resort with swimming pools, hot tubs, a health spa, casino, plus tons of other things to you can choose from to customize your vacation. And since we herald your indecisiveness, check out our 12 different restaurants, 24-hour room service or one of the 11 bars and lounges. You make the rules, ensuring you cruise the Baltic like a king. Prices begin at US $2048.40 per person, based on double occupancy. The price includes all port charges, taxes, shipboard accomodations, ocean transportation, meals, some beverages, and most onboard entertainment. To reserve a cabin on the Legacy Genealogy Cruise 2008, call Christy of Travelworks International at 1-888-505-6997 or email her at twivacations@comcast.net. Or book securely at https://www.legacyfamilytree.net/Secure/OrderCruise2008.htm.